Welcome to the Desert of Man, blogging home to Science Fiction reader and experimenting writer Mack Meijers. From time to time I open the stage to other creative souls to shine a spotlight on them as human beings, their thinking and their work. 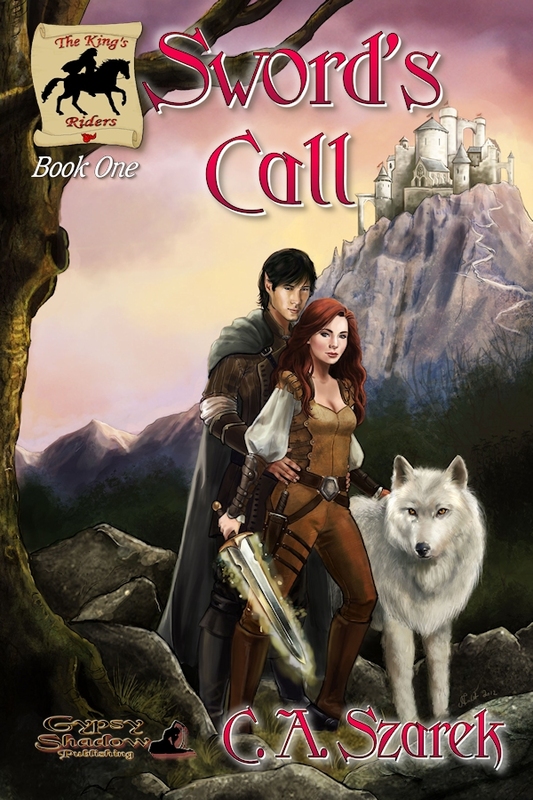 This time the light shines on Chrissy Szarek facing the Spotlight Questions and featuring Sword’s Call. C.A. is originally from Ohio, but got to Texas as soon as she could. She is married and has a bachelor’s degree in Criminal Justice. She works with kids when she’s not writing. She’s always wanted to be a writer and is overjoyed to share her stories with the world. For generations, the Ryhans, ruling family of the Province of Greenwald have been keepers of a sword rumored to possess enough magic to defeat kings. Lord Varthan, a former archduke and betrayer of the king, covets the sword and invades Greenwald. Lady Ceralda Ryhan, daughter of the murdered duke, gains the sword and flees, trusting only her white wolf, Trikser—magically bonded to her. Cera needs nothing more to aid in her fight. Jorrin Aldern, half elfin and half human, left his home in the mountains of Aramour to find his human father who disappeared twenty turns before, but finds Cera with Varthan and his shades on her tail instead. His dual heritage and empathic magic will tempt Cera in ways she never thought she’d desire. But can he convince her trust and love can pave the path to redemption or will the epic battle end in tragedy and evil conquer them all? You can find the book right here! What was the challenge of this project? Sword’s Call was a major labor of love for me. I started it when I was 21 and that was quite a long time ago. *wink* I got away from writing, finished college and grew up. I got married and then finally got back to writing. It’s much different than when I started it, but I love this story and always will. Where was the fun in this project? Making up my own world! It’s fun to craft something. Start to finish, make everything, the rules, the people, the geography. It’s awesomely fun! What stories do you like to hear, create and share? For me as a reader, I’m not usually concerned with intended audience. If it looks like a good read, I will read it. I don’t care if it’s YA, thriller, horror. I do read alot of Romance since l write it, but alot of times my reading selections are diverse. If you were a teacher, what would be your best lesson to teach? Never give up. If you want it, go for it. Fight for it. What do you think is the best way to share a story? In this day and age, there are many many ways to share a story. I think you pick the best venue for you. If it’s a book, it can be in e-format or a paperback, hardback. You can share it on your blog, you can share it in person. You can share it in a speech in front of a group of people. There is no wrong place or method if it’s right for you. Do you think you could survive in the wild, on your own? Absolutely not. I am a total city girl. Hopefully some kind of instinct would kick in or I would be doomed. Or I could have lots of supplies…that might be good. How do you get up every morning? By my alarm. Dragging, usually. I am not a morning person, coffee is much required. But if you want a more philosophical answer, I try to have a positive outlook. Always. Conquer the day kinda thing. Usually I am making mental lists of all I need to accomplish. Have you ever failed? What did you learn from the experience? Sure. Everyone has failed in life. Doesn’t matter what we’re trying to do, how we live. We all fail, but that’s how we LIVE. How we learn, move on, hopefully don’t repeat the same mistakes. When I fail—when I have in the past—I learned to never give up. I have to fight for what I want. Given the chance, how would you travel the world, where, and why? I would go to Scotland and Japan. Those are to places on my bucket list. I have always loved both countries. I will get there someday. What place has technology in your life? I am glued to it. Dependent. Like most of us. It’s not always a good thing. Technology allows connections in ways we were not able, even twenty-five years ago and this will continue to deepen in this digital age. I think it has its pros and cons, like everything. I feel naked without my iPhone. If your life was a book, who would you like to write it? Me. I know myself and my story better than anyone else, but I don’t think I would ever venture into memoir or autobiography territory. I will stick with fiction. Heart pounding and fists clenched, Cera sat in the Dragon’s Lair’s darkest corner. By her choice, the candle on the table was unlit. The bowl of stew was half eaten, food the last thing on her mind. “Shhh, Trik, it’s all right.” She ran a hand through his fur, smoothing his hackles along the length of his spine. The big wolf looked up at her and licked her hand. One corner of her mouth lifted and she bit back a sigh. The only reason the owner of the tavern, Marshek, even let him in was because no one else was allowed to enter the Dragon’s Lair if she was inside without him. No one according to Trikser, that is. He’d almost taken the hand off the last guy who’d tried. Marshek was known to be tolerant of elves, but he hated what he called half-breeds. Cera could imagine what the grumpy, middle-aged tavern owner was thinking, and it wasn’t friendly. She rose, Trikser also immediately rising, awaiting her move. The white wolf was her bond mate and had been since he was young. She moved to the bar, her wolf following, slinking close to the floor, moving in a slight crawl. His belly probably touched the filthy planked flooring of the tavern. Cera made a face, but forced a breath. Detached control. Sliding onto the stool next to the halfelfin man, she was just in time to hear his order. His voice was clear and deep. Cera couldn’t see the hue of his eyes from her seat, but his high cheekbones made his profile appealing, his sleek tapered ears adding to the attraction. His powerful jaw line was clean shaven, an oddity in these parts. She could tell he was aware of her perusal. He was young, not much older than her, and had the stunning beauty of the elves. His chest heaved, and he finally glanced at her. Blue. His eyes were a deep, sapphire blue. Her heart skipped a beat, but she ignored it. The man said nothing, not that she’d expected him to. Thank you, Chrissy Szarek, for your openness and your work! Are you a creative soul with a focus is on the genres of Science Fiction, Fantasy, Action & Adventure and Mystery & Thrillers, including their respective sub categories (Steampunk, Survival, Horror)? Would you like a Spotlight? Feel free to read all about it and get in touch right here. Mack Meijers reads and writes Science Fiction, feel free to get in touch to suggest stories, books and tales to him. If you’d like to show a sign of support, by all means give a “like” on his Facebook Page and hook up! He won’t mind visiting his Wish List or buying a story either. Thank you for having me today! I appreciate the shout out! This entry was posted on August 8, 2013 by Mack Meijers Writes in Muse, Musings, Read and tagged Action, Adventure, art, Awesome, books, Creating, entertainment, fantasy, Film, Horror, Interview, media, Mystery, Novels, Reading, Science Fiction, Space Opera, Spotlight, Steampunk, Survival, Thinking, Thriller, Writing.